Did you know that Doug Henning and his Broadway play, "The Magic Show", was not a new idea? 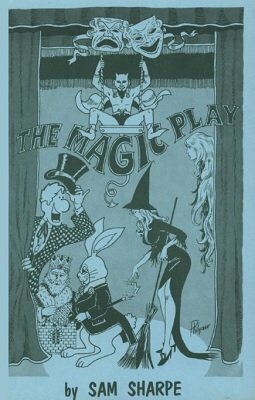 Do you know about the hundred or more years of Magic Plays that preceded Doug's triumph? If you truly are a magician, you should know all about the background of your hobby or profession - and here's a very pleasant way to find out about it. Sam Sharpe (M.I.M.C.) has done extensive research to produce this volume, The Magic Play . 150 pages of absorbing reading, all about the use of magic in dramatic plays, what tricks were used, what famous personages used them, where they were used, how they were used, in what countries, and other data. Several famous magicians, including Houdini, not only wrote their own plays but acted in them. The complete text of one of the most famous of all magic plays, "Will, the Witch and the Watchman" is included, illustrated with rare prints. Doug Henning succeeded because he came up with an idea that was new for his day. The big need now in magic is for "something different." That calls for inspiration and a book like The Magic Play is inspiring to the thinking magician. A fun book for good reading, but very informative. 1st edition 1976, 150 pages; 1st digital edition 2014, 126 pages.